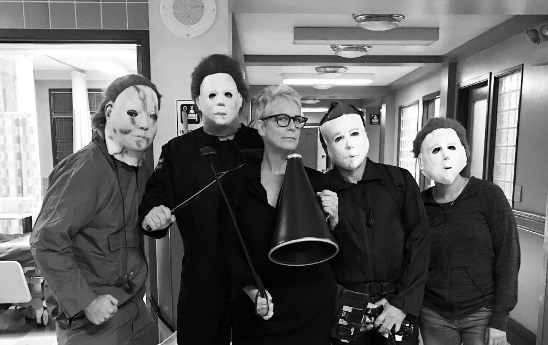 Many genre icons and general celebrities took to their social media accounts this past weekend to show off their 2016 Halloween costumes and how they celebrated our favorite holiday, and we have collected some of our favorite images that were posted for you to view as you come down from your trick-or-treat candy high. Horror scream queen and new mom-to-be Danielle Harris dressed as Disney’s Minnie Mouse, while legendary vampire slayer Sarah Michelle Geller turned villainous as Poison Ivy and Game of Thrones stars Maise Williams and Sophie Turner were a pair of hash brownies, among other highlights. I probably should have mentioned I’m poison…..
First Look at Jamie Lee Curtis in ‘Scream Queens’ Revealed! Danielle Harris Takes ‘Hollywood Death Trip’ on E!